Do wind turbines reduce carbon dioxide (CO2)? How much gravel / concrete for Ontario’s wind turbines? An additional 10,000 acres of vegetation are being cleared to install wind turbines in Ontario (details below). This number doesn’t include the thousands of acres of transformers & substations. It doesn’t include the thousands of km of access roads. It doesn’t include the thousands of km of transmission lines. At the Criterion Wind Project in Maryland, Post-Construction mortality monitoring studies were conducted. “The monitoring study period was from April 5 to November 15, 2011. Search plots were established around all 28 turbines in the project and the carcass search schedule was for daily searches at all turbines (weather and safety permitting). Search plot size varied in shape and size, due to habitat constraints, but in most cases areas up to approximately 40-50 m (~130-165 ft) from the turbines were cleared of vegetation for access and construction purposes and this area was used as the search plot. This quote was received by email so there’s no web source referenced. 6,700 km of new transmission lines for Ontario? Do wind turbines reduce Ontario’s low emissions? Wind turbines generate some electricity (when not consuming electricity in standby mode), but do turbines increase or decrease CO2 emissions? How many CO2-consuming trees & food crops will no longer grow on land replaced with turbine access roads & electrical infrastructure? 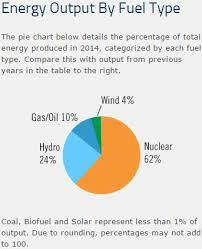 How much CO2 is generated by the manufacture, transportation, installation & operation of wind turbines? How many buses does it take to measure a wind turbine? 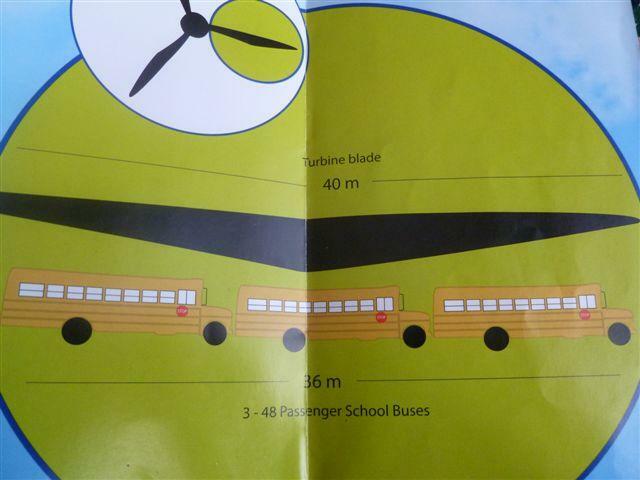 How big is a wind turbine compared to a 48 passenger school bus that is 12 m long? Some 2.5 MW GE XL turbines have a 100 m tower. Lying on the ground (as they do during assembly), this would be the length of 8 school buses parked bumper to bumper. Each of the three 50 m blades is the length of 4 buses for another 12 buses. The nacelle is the size of one school bus. Therefore, it would take 21 (8 + 3×4 + 1) school buses to measure all of the components of a wind turbine as they lie on the ground during the construction phase. 4,500 kilometres of wind turbine access roads in Ontario? … assuming that each of the 6,000 or more turbines installed or proposed for Ontario require 750 m of access road to support construction and transportation vehicles to each turbine site and for use during the operation phase. Access roads are approximately 5.0 m wide post-construction. 22.5 million square metres / 4046.86 square metres per acre = 5,560 acres consumed by turbine access roads, not including turbine foundations, power lines, substations, transformer stations etc. You are currently browsing the archives for the Scale of Ontario projects category.